Forecasters on Wednesday predicted the San Diego region is in for a second day of hot, humid weather interrupted by heavy afternoon thunderstorms. Temperatures were expected to be lower than on Tuesday, but offset by humidity from a weakening Tropical Storm Odile in Mexico, with temperatures in the 90s inland to low 100s in the deserts. A National Weather Service flash flood watch for San Diego County’s mountains and deserts will take effect at 10 a.m. and extend until 8 p.m. Forecasters said the storms would be relatively stationary, which will add to the likelihood of heavy rainfall over one location in a short amount of time. The risk of flash flooding will be the greatest along desert slopes and in areas recently denuded by fire. 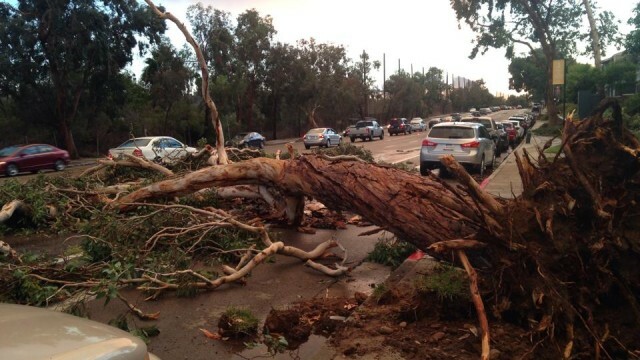 The heavy rain, hail and stiff winds sent trees and power lines crashing down onto roads and buildings on Tuesday, as temperatures soared into the triple digits inland and spread humidity throughout the county. At about 6 p.m. Tuesday, gusts tore a hangar off its moorings at Montgomery Field airport in Serra Mesa, according to the San Diego Fire-Rescue Department. The structure blew into several airplanes, knocking two of them over and causing a roughly 30-gallon fuel spill. 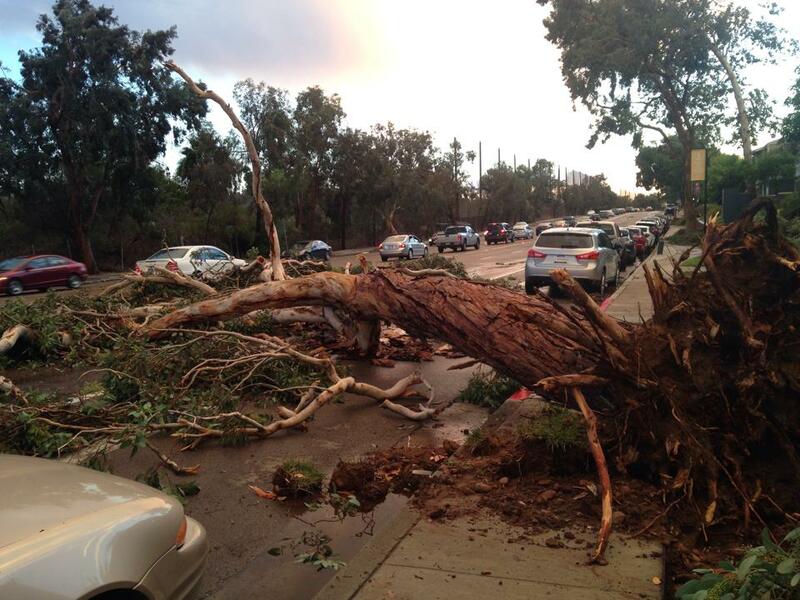 In the East County, the storm knocked over trees and power poles, damaged homes, vehicles and commercial structures and blocked roads, according to Cal Fire. No injuries were reported. Students at schools without air conditioning in San Diego, Chula Vista, Coronado and National City were sent home early Monday and Tuesday as remnants of Tropical Storm Odile swamped the region. While the Coronado, National and Sweetwater districts planned to maintain a minimum-day schedule again today, the San Diego Unified School District has opted to return to a normal schedule for all schools. Those trying to beat the heat can head to more than 100 air-conditioned buildings, such as libraries and recreation centers — dubbed “Cool Zones.” A list of county Cool Zones is available at CoolZones.org. or by calling 211. Forecasters urged people to schedule outdoor activities for the cool of the morning or in evening, to take frequent breaks in shady or air-conditioned areas and to know the signs of heat exhaustion and heat stroke. Those planning to be outside were advised to wear light, loose clothing and to drink plenty of water. A cooling trend is expected to begin Thursday and bring temperatures back down to near-normal readings by the weekend, the weather service advised.